As the long-anticipated flood of environmental, social and governance information has at last arrived, will data science finally allow our capital markets to grow up? Sitting 30 feet from the podium, noticing all the people around the room, many of them friends, who had played a major role in the recent success, I felt a sense of pride. I had been one of the participants in this historic metamorphosis, as corporate executives and investors had slowly moved over decades from indifference to action on climate change. Click below for the full timeline. 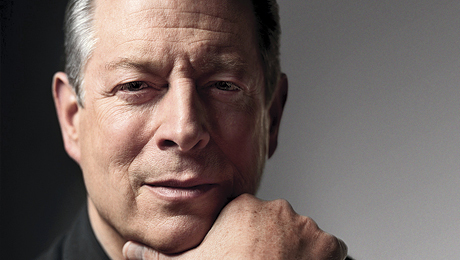 Back in April 1992 I had invited thenTennessee senator Gore to come to Boston to speak about his new book, Earth in the Balance, to hundreds gathered in the Omni Theater at the Museum of Science. In 1997, as president of Ceres, the largest coalition of environmental groups and institutional investors in the U.S., I had, with my co-founder Allen White, launched the Global Reporting Initiative, an international effort to standardize the measurement of sustainability performance, including data on greenhouse gases. The GRI had been formally established as an independent standard-setting body in the spring of 2002, in that same Delegates Dining Room at the U.N.
Only a few months later, in October, I had met with an old friend, United Nations Foundation president Timothy Wirth, in the lobby of San Franciscos Fairmont hotel on the morning after his daughters wedding. I proposed that the U.N. host a meeting of state treasurers and other pension trustees to learn about the financial consequences of climate change so they could evaluate the risk in their vast portfolios. The resulting organization, the Investor Network on Climate Risk (INCR), has remained a project of Ceres and has deepened its impact under the leadership of Ceres president Mindy Lubber. On the day of Gores recent INCR speech, the value of the combined assets of institutions gathered at the U.N. was an astounding $22 trillion. Equally important, this group is playing a major role in the shift in investments away from the collapsing fossil fuel industry and into renewables. Last year investors poured $329 billion into new energy, well on the way to the annual target of $1 trillion. Listening to Gore, I felt relief that finally, after so many years of delay, the challenges and opportunities embedded in a new, low-carbon future were rapidly becoming clear. I also began to realize that this awakening about carbon is not the end but only the next chapter in a dramatic and ongoing story. All around, one can start to see a dramatically new form of capitalism rising, though still largely unnoticed  a capitalism driven by the outpouring of unimaginably vast amounts of information, tamed by increasingly sophisticated tools from data science, guided by deeper and smarter questions and thus far better equipped to generate the just and sustainable economy that our planet must discover to survive. The concept of sustainability has been moving from the periphery of investment and business toward its center for a generation. As sustainability has become more important, scores of new institutions have arisen to promote the release of information about corporate environmental, social responsibility and governance (ESG) performance. The rising demand has triggered an enduring debate about the relevance of sustainability to the creation of value, and ideas have differed greatly about whether value should be understood broadly across the whole company, and all its stakeholders, or narrowly as short- to medium-term financial benefit for those who own stock. The resolution of this debate has not been left solely to corporations, however, as more and more institutional investors, particularly the largest, passively invested pension funds, have realized that they have a stake in the question of whether companies are seeking short-term earnings gains or long-term value creation. Moreover, they have realized that even by forming opinions on this matter, they have been establishing precedents not just for corporate policy and governance but for themselves. A key driver of change has been the powerful association of global pension funds known as the International Corporate Governance Network. 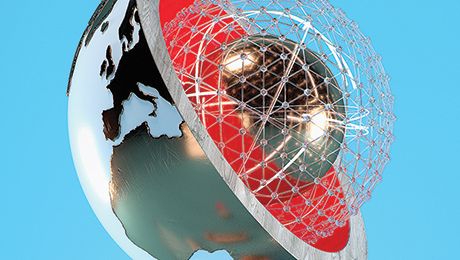 ICGN began modestly in 1995 as a mechanism through which huge investors and pension funds from around the world could begin to share ideas about best practices in corporate governance, such as board composition, executive pay and proxy access. It didnt take long for people to figure out the value of setting standards across borders, says Stephen Davis, one of the founders of ICGN and currently associate director of the Harvard Law School programs on corporate governance and institutional investors. Still, in ICGNs early days it was not easy to persuade the organization to think about the systemic problems of sustainability. In May 2002 I traveled to Milan as president of Ceres to speak to an annual ICGN meeting about the then-new topic of climate risk. In my plenary presentation I proposed that the largest planetary changes in human civilization might create significant dangers for the industries and regions in their diversified portfolios  and that this suggested that fiduciaries should at least assess the scope of the problem. My charts, graphs and images of burning forests and rising sea levels had little impact. At dinner a few hours later, few of the other conference-goers would even look at me, let alone talk to me. No matter, I thought; if we cant persuade an existing group of institutional investors to care about climate change, perhaps we can create a new one that does. ICGNs dismissive rejection of any discussion of climate was one of the reasons the INCR was launched the following spring. Over the past 16 years, other powerful organizations have come into being and gradually asserted themselves. In 1999, U.N. secretary general Kofi Annan launched the Global Compact, a mechanism for getting corporations to endorse principles that corresponded with U.N. agreements that had already been signed by many of the worlds governments. Not long afterward the Global Compacts thenexecutive director, Georg Kell, realized that the entities with the most influence over corporate behavior were not their home governments but their investors, so he supported the effort by James Gifford to create the U.N. Principles for Responsible Investment. The PRI started humbly, expressing the initial view that investors, not just companies, should think about the implications of their holdings for the worlds social and environmental goals. Through hundreds of meetings and mind-numbing patience, the PRI expanded its ranks, opened the discussion on whether fiduciary duty permitted investors to take such considerations into account and concluded that such duty not only allowed but required it. Today the PRI has more than 1,400 members from 50 countries, with combined assets of more than $42 trillion. The success of the GRI in creating a stakeholder-driven set of guidelines for companies to measure and disclose their sustainability performance, combined with supporting pressure from engaged investors, such as the ICGN, INCR, PRI and Interfaith Center on Corporate Responsibility (ICCR), triggered tens of thousands of consulting jobs and sustainability reports  and a backlash of complaints. Why did the world need all this information? This question had already been addressed through the groundbreaking work of three successive commissions in South Africa chaired by retired South African Supreme Court justice Mervyn King. Although the first report, issued in 1993, called for South Africa to adopt existing best practices for corporate governance, the next two (released in 2002 and 2009) strengthened the argument that different kinds of information were essential to wise decisions by both companies and investors. Indeed, Kings third review recommended that South African companies issue sustainability reports according to the GRI and that the Johannesburg Stock Exchange require all listed companies to release sustainability information. Like moves on a checkerboard, each advance opened up strategic next steps. King became chairman of the GRI and began promoting the adoption of sustainability information on an international scale as part of what he called integrated thinking. By 2010 a new question had emerged: If value creation required the successful management of both sustainability and financial performance, couldnt this integrated thinking be communicated in an integrated report? To explore this question, Britains Prince Charles, who had created the Accounting for Sustainability organization in 2004, appointed King to lead a new entity, the International Integrated Reporting Council (IIRC). The IIRC was governed by a prestigious group of leaders who swiftly handed off the task of writing the framework to a working group of professional accountants and consultants seconded from the GRI and the Big Four accounting firms. I served on that working group, whose regular meetings over three years turned into cauldrons of competing ideas about the future of the corporation as an institution. The committee sometimes strained like a car whose driver had one foot on the accelerator and the other on the brake  trying to move forward without moving too fast or too far  but the IIRC eventually produced a framework that offered something new. Though wrapped in safe language about the preeminence of the providers of capital, the IIRC Framework reaches the surprising conclusion that business  indeed, capitalism  in the 21st century needs to be fundamentally reconceived. Instead of the simplistic finance in, finance out model captured by traditional accounting, the document argues, we must recognize that businesses draw from many forms of capital, including natural capital, human capital, intellectual capital, manufactured capital and social capital. Those capitals are spun through company-specific business models, which then produce outputs for every form of capital. The old system only measured whether a business model generated more financial capital than it took in. This is comparable to judging your health solely by whether air is moving in and out of your lungs. The newer system looks instead at whether the business model enhances or depletes each form of capital. This argues for a radically new and more comprehensive balance sheet  one that might reveal whether financial capital has risen in harmony with, or at the expense of, costs to natural capital and human capital. As a result, we can answer a question that previously was invisible: Are companies extracting financial value by depleting other forms of capital, or are they, as they so often contend, creating joint gains across them all? What is it that is pushing capitalism toward a more integrated understanding of the role of business and investment in our political economy? It is because the forces favoring disclosure  and the deepening understanding of how value is created  have become unstoppable. In the era of climate change, water scarcity, wealth inequality and resource depletion, we can no longer disregard the interconnectedness of both problems and solutions. The hugely influential networks in the great alphabet soup of sustainable capitalism  GRI, ICCR, ICGN, IIRC, INCR, PRI and CDP (originally the Climate Disclosure Project)  are becoming more powerful with every passing year. They are being joined by formidable new allies, such as the Bank of England, the World Economic Forum, the European Union and the worlds stock exchanges. A striking example is Peabody Energy Corp., the largest publicly traded coal producer in the world. Though the SEC introduced new interpretive guidance in 2010 (originally proposed by Ceres) that companies should disclose their climate risk, Peabody Energy management said it was simply not possible to predict whether climate change would have any impact on its operations. Such a response willfully disregarded the growing systemic threats created by new government regulations, diminishing demand, competition from natural gas and the growing rejection of coal as a fuel source because of its high greenhouse-gas emissions. After a two-year investigation by the New York State Attorney Generals Office, the company agreed in November 2015 that it would provide more such information in the future. The damage, however, had already been done: Peabody stock dropped from more than $1,000 a share in 2011 to about $2 late last month. The demand for more information is being fueled in part by the diffusion of several fresh approaches to investment as new players reject the damaging short-termism of most investor behavior. In a recent study market research firm MSCI distinguished three growing new categories of investors: value-based, who want their portfolios to align with their principles; impact-based, who want to see measurable social returns; and long-horizon, who want to limit their exposure to systemic problems like water scarcity and carbon regulations. MSCI pointed to the huge market segment made up of pension funds that remain passively indexed across the entire market. Because they cant jump around looking for alpha (above-market returns) through trading, such investors are probing more deeply into beta returns by examining companies long-term capital investment projects, governance structure and treatment of ESG issues. And as they do so, they want to know more. To serve these growing market segments, Wall Street firms like BlackRock, Goldman Sachs Group and Morgan Stanley have firmly moved into the field of ESG investing, offering not only fossil-fuel-free funds to respond to the carbon divestment movement that has swept the U.S. but also other ESG-driven instruments. 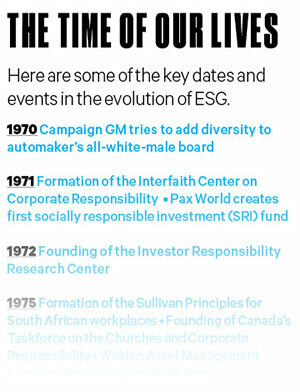 These developments  combined with a shift in the cultural values of Millennial investors  means that using ESG information increasingly will be an unremarkable part of the investment process, just as such data now sits comfortably alongside traditional metrics on the worlds Bloomberg terminals. Newer firms like London-based Generation Investment Management, founded a decade ago by Gore and former Goldman Sachs Asset Management CEO David Blood, have experimented with additional techniques for assessing sustainability information in selecting investments  and have chalked up superior returns. Some managers are experimenting with algorithms that can integrate and correlate financial and sustainability data in picking long-term winners. Arabesque Asset Management is billing itself as an ESG quant shop on the claim that sustainability information is now of adequate quality and quantity to extract patterns and generate actionable information for investment decisions. Omar Selim founded the London-headquartered firm in 2013 based on an asset management project he had developed at Barclays Bank and tapped Harvard professor Eccles as chairman and former Global Compact director Kell as vice chairman of its board. A final driver of the shift to a much deeper understanding of the relationship between investing and value creation is coming from the immense and still rapidly growing world of pension funds. While day-to-day skirmishes are taking place over the value of ESG information, a much larger metamorphosis is overtaking the capital markets that will reshape not only how investments are made but the face of capitalism itself. This transformation will happen when all the forces of change, each gathering strength separately, finally converge: as investors demand more-­comprehensive sustainability information, as stock exchanges put pressure on companies to release it, as standard-setters render that information more reliable, as companies begin to generate billions of new data points, as these data points are collected and released through Bloomberg terminals and other mechanisms, and as they are eventually correlated with other data from government, social media, user logs, geographic information system maps and market transactions. Already, the world creates an estimated 2.5 exabytes  or 2.5 billion gigabytes  of data every day, meaning that in the past two years human beings have produced 90 percent of the data ever created. To comprehend the data, analysts will increasingly turn to advanced artificial intelligence. These programs are constantly learning from new information and can offer analyses in a rapid manner. The better the program, the more valuable the information and connections that can be derived and given to decision makers. A current limitation in the data science community is the processing speed required for some of the artificial intelligence programs being employed. Currently, artificial intelligence is not advanced or efficient enough to fully gather all the information possible from these massive sets of data, and large investments must be made either to implement proper computing systems or to rent cloud computing services from a company like Amazon.com. Whether we like it or not, and whether we are ready or not, we have entered a universe in which quadrillions of data points are gathered on almost every aspect of our individual and institutional lives. Right now tens of thousands of people are laboring to discover what kinds of insights such big data might offer. Despite the mighty challenges in addressing data quality, availability and connectivity, the central questions that we now face as a society are philosophical: What do we want to know, and why? What are the signals that we are looking for in the middle of this ocean of noise? We could extract intelligence for many reasons: to advance our own interests, to understand markets better, to create improved products, to predict the future, to expand our control and to make money. All those incentives will drive the system of big data forward. But here is the surprising reality: In addition to all of that, we also could employ the ever-improving field of data science to understand the complexities of business and capital markets in breathtaking new ways. 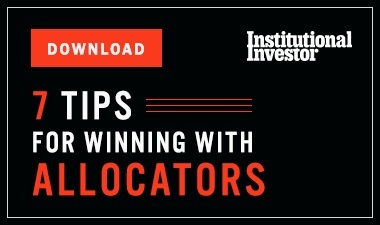 There already is a strong drive from several quarters to place corporate and investor performance in their larger regional or global contexts. Many of the disclosure instruments invented over the past two decades, including the GRI, have focused on the release of aggregated information at the institutional level, which is most relevant to investors. In the past the push was for a company like Ford Motor Co. to gather all the information from all of its far-flung units and report on its total energy use. But now, with the creation of global goals on environmental and social concerns ranging from the national greenhouse-gas targets of the COP 21 Paris meeting to the comprehensive Sustainable Development Goals for 2030 released by the U.N., the focus will expand to include the institutional contribution to the sustainability context  the impact within specific geographic limits and targets. Through this lens one asks less about the performance of a company as a whole and more on how its products  and research, marketing and capital expenditures  affect the overall greenhouse-gas emission targets of a particular place, such as France. An equally promising project has been launched by Steven Lydenberg, a longtime pioneer in the integration of ESG information and founding director of Harvards Initiative for Responsible Investment. Lydenberg has proposed the bold Investment Integration Project to look at the collective action problem  how the combined decisions of portfolio managers often end up negatively affecting the stability and sustainability of whole industries and ecosystems. As part of the evidence for this expansion of perspective, Lydenberg points to Bank of England governor Mark Carney, who in September surprised financial markets by highlighting climate change as a major threat to global economic security. Carney, who chairs the powerful Financial Stability Board, has launched the Task Force on Climate-­Related Financial Disclosures, chaired by Michael Bloomberg. One of the most alluring opportunities offered by the new approach to sustainability data is to put real flesh on the conceptual bones set forth by the IIRCs multicapital model. Today the idea of correlating the relative inputs and outputs of six forms of capital would seem conceptually valuable but computationally impossible. The creation of new data driven by new algorithms will allow us to explore previously hidden correlations that could have a major impact on value. For example, though every CEO ritually announces that our employees are our most important asset, the real assessment of the value of human and social capital within companies has been skimpy. To tackle the task, one must ask new questions about the relationship between the complex needs and skills of employees and other forms of performance. Under what circumstances would training ones own workforce provide a better stock price or a lower cost of capital? How could we tell which forms of work flow or decision making would best enhance all the capitals required by a business model to succeed? Could broader and more democratic participation and higher degrees of diversity increase a companys ability to respond to a complex and rapidly changing technical and competitive environment? And what about natural capital? Peter Adriaens, a professor of environmental engineering and entrepreneurship at the University of Michigans Ross School of Business, formed Equarius Risk Analytics in 2013 to unlock market signals and asset risk valuation from environmental exposure. His firm, which has offices in Ann Arbor, Michigan, and New York, specializes in water risk and not only provides detailed quantitative analysis of the systemic water risk that whole industries face but is able to drill down to identify the degree of volatility for the value of each company. This model could be expanded to virtually every form of environmental risk, such as extreme weather events, the dispersal of toxins, the deterioration of air quality and soil depletion  all of which could threaten the sustainability of companies and industries. When it comes to the evolution of accounting, would a broadened form of the discipline lead us to a new definition of profitability, so that we could learn to avoid transactions that might create a large profit for financial capital even though they were generating a huge loss for natural stocks? Or, to put it differently, what would it mean if corporations set out to create profits in all the nonfinancial capitals, so that business became a system for the manufacture of endless joint gains  an engine that drives a virtuous cycle of ever-improving health and prosperity? Every one of these questions, and hundreds like them, are now viewed as too complex to study, so we see only sporadic attempts. Indeed, despite our belief in our own sophistication, we settle too often into the senseless trap of asking only questions that we think we can answer or offering simple responses to complicated questions (both innate cognitive reflexes well documented by behavioral economists). We could be doing something else. And we will. If the Global Reporting Initiative, the International Corporate Governance Network and the U.N. Principles for Responsible Investment could appear in the 1990s; if the Investor Network on Climate Risk and the inclusion of ESG information in Bloomberg terminals could happen in the 2000s; if the businesses and investors of the world start using the drive to decarbonize our economy and correct for inequality to rethink capitalism from the ground up in this decade, then where will we be  where could we be  ten years from now, in 2026? Or in 2036? The complexity and force of the capital markets, combined with the culture-­shifting introduction of unthinkably vast computing capability, create a challenge not just for executives, investors and policymakers but for the whole of humanity. Instead of focusing on the narrow band of financial performance and bending reality to fit into our notions of what matters rather than the other way around, we now can ask the questions whose answers we really want to know  questions that would protect and advance not just our economies but our civilizations. To do so might require  and prompt  an evolutionary surge of intelligence and awareness, but such things have happened before. The prize would be great, for it would provide new answers to one of our most pressing questions: Is capitalism primarily a cloaked transferal of human and natural capital from public value to private wealth, or, as the world faces more constraints and deeper problems, will it finally grow up and rescue both people and the planet with a wisdom commensurate with its power? Bob Massie served as the president of Ceres from 1996 to 2003, was co-founder of the Global Reporting Initiative in 1998 and was the initiator of the Investor Network on Climate Risk in 2003. He is now executive director of the Sustainable Solutions Lab at the University of Massachusetts Boston.